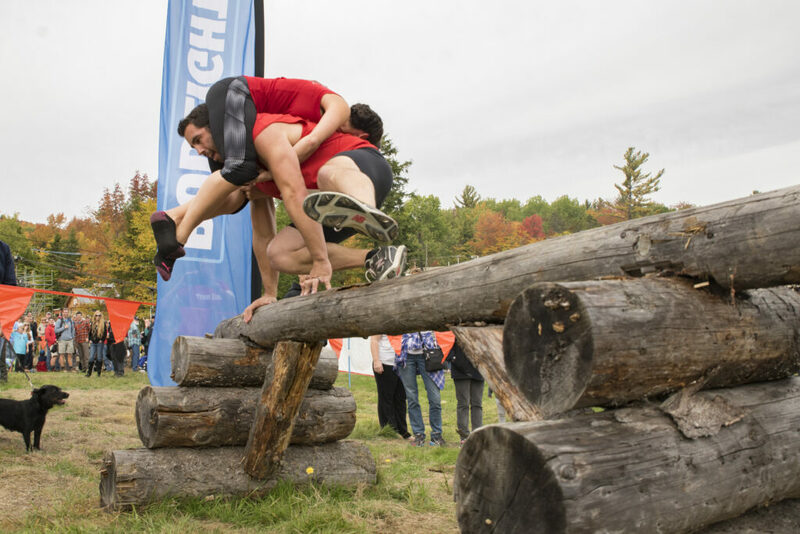 Strongman meets obstacle course racing meets matrimonial love in one of the most bizarre strength events we’ve ever seen: wife carrying. At first glance, the event might look like a little like an especially bumpy yoke walk. At second glance, like an elaborate obstacle course race. But wife carrying is well and truly in a league of its own, and requires a combination of strongman and aerobic training that had tremendous appeal for Elliot Storey, the 2007 strongest lightweight in New England’s Strongest Man and, with his wife Giana, the winner of the 2016 North American Wife Carrying Championship. At 278 yards, the course isn’t exactly long, and the Storeys conquered it in 57.5 seconds. But it was a pretty damn intense minute. The course starts on a mountain, so it’s uphill from the get go, and halfway up the summit the teams encounter a 40-inch hurdle made from logs. After that, they need to traverse excavated ground, run through a forty-foot mud pit, and climb up a four-foot high sand pile. Elliot and Giana during their winning race. He credits their win to their log-leaping technique. Wife carrying might look kooky, but Storey took his training very, very seriously. To build his cardio, in addition to twice-weekly four-mile jogs, he racked up thirty-five miles on his bicycle every workday by commuting to his engineering job and hitting up a forty-five minute ride during his lunch hours. On weekends, he crushed daily twenty-minute hill sprint workouts, occasionally in a weighted vest. Then, of course, there’s the strength training. After hitting the weights, he hit up the strongman yard for plyometric circuits. His go-to workout was three to four circuits of ten depth jumps, either twenty step-ups with 160 pounds or twelve step-ups with 240 pounds, and ten box jumps with 35-pound beer kegs held in each hand. The exercise component tends to be less demanding on the wife. Giana Storey is an aerobics instructor, which provided her with a base of fitness that helped her stay attached to her husband during the minute of racing. The most successful teams have the woman holding onto her own legs, so she emphasized grip work, posterior chain strength, and stabilizing exercises. The real challenge for female competitors is weight loss: it’s important to lose as much weight as possible to minimize the “husband”’s load. In addition to her regular conditioning classes, Mrs. Storey was spending two hours per day in a sauna during the final weeks of her preparation for the event. Elliot and Giana Storey leading Richard Cannon and Annie Leslie on their way to winning the 2016 North America Wife Carrying Championship at Sunday River Ski Resort in Newry, Maine. If you think you might have what it takes – which, remember, involves a very willing partner – you can run in the next North American championship on October 7, 2017. (The prize money is five times the woman’s pound weight in dollars.) 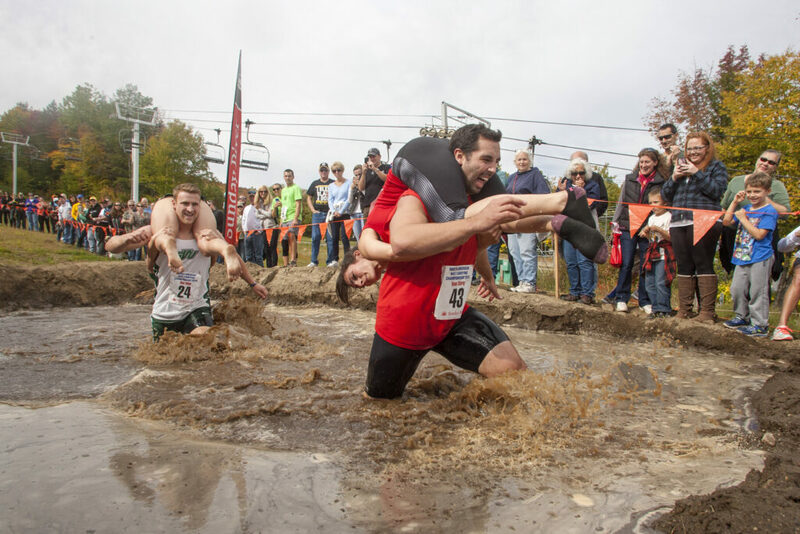 There were also six other sanctioned wife carrying events held around the U.S. this year; keep an eye on this page to learn about upcoming races. Thanks to Elliot and Giana Storey and Taisto Miettinen for their help with this article. Images courtesy of Sunday River.